To really study something, you want to reach out and touch it. But what can you do if you’re separated by a huge distance? You reach out with electromagnetic or sound waves and watch how they bounce back. Thanks to radar, sonar and lidar. * A combination of the above! Asteroid 2014 JO25, discovered in 2014 by the Catalina Sky Survey in Arizona, was in the spotlight today (April 19) when it flew by Earth at just four times the distance of the Moon. Today’s encounter is the closest the object has come to the Earth in 400 years and will be its closest approach for at least the next 500 years. Lots of asteroids zip by our planet, and new ones are discovered every week. What makes 2014 JO25 different it’s one of nearly 1,800 PHAs (Potentially Hazardous Asteroids) that are big enough and occasionally pass close enough to Earth to be of concern. PHAs have diameters of at least 100-150 meters (330-490 feet) and pass less than 0.05 a.u (7.5 million km / 4.6 million miles) from our planet. Good thing for earthlings, no known PHA is predicted to impact Earth for at least the next 100 years. Most of these Earth-approachers are on the small side, only a few to a few dozen meters (yards) across. 2014 JO25 was originally estimated at ~2,000 feet wide, but thanks to radar observations made the past couple days, we now know it’s nearly twice that size. Radar images of asteroid were made early this morning with NASA’s 230-foot (70-meter) radio antenna at Goldstone Deep Space Communications Complex in California. They reveal a peanut-shaped asteroid that rotates about once every 5 hours and show details as small as 25 feet. The larger of the two lobes is about 2,000 feet (620 meters) across, making the total length closer to 4,000 feet. That’s similar in size (though not as long) as the Rock of Gibraltar that stands at the southwestern tip of Europe at the tip of the Iberian Peninsula. “The asteroid has a contact binary structure — two lobes connected by a neck-like region,” said Shantanu Naidu, a scientist from NASA’s Jet Propulsion Laboratory in Pasadena, California, who led the Goldstone observations. “The images show flat facets, concavities and angular topography.” Contact binaries form when two separate asteroids come close enough together to touch and meld as one. Radar observations of the asteroid have also been underway at the National Science Foundation’s Arecibo Observatory in Puerto Rico with more observations coming today through the 21st which may show even finer details. The technique of pinging asteroids with radio waves and eking out information based on the returning echoes has been used to observe hundreds of asteroids. When these relics from the early solar system pass relatively close to Earth, astronomers can glean their sizes, shapes, rotation, surface features, and roughness, as well as determine their orbits with precision. Because of 2014 JO25’s relatively large size and proximity, it’s bright enough to spot in a small telescope this evening. It will shine around magnitude +10.9 from North America tonight as it travels south-southwest across the dim constellation Coma Berenices behind the tail of Leo the Lion. A good map and 3-inch or larger telescope should show it. Use the maps at this link to help you find and track the asteroid tonight. The key to spotting it is to allow time to identify and get familiar with the star field the asteroid will pass through 10 to 15 minutes in advance — then lay in wait for the moving object. Don’t be surprised if 2014 JO25 deviates a little from the predicted path depending on your location and late changes to its orbit, so keep watch not only on the path but around it, too. Good luck! Comets hide their central engines well. From Earth, we see a bright, fuzzy coma and a tail or two. But the nucleus, the source of all the hubbub, remains deeply camouflaged by dust, at best appearing like a blurry star. To see one up close, you need to send a spacecraft right into the comet’s coma and risk getting. Or you can do the job much more cheaply by bouncing radio waves off the nucleus and studying the returning echoes to create a shadowy image. Although crude compared to optical photos of moons and planets, radar images reveal much about an asteroid including surface details like mountains, craters, shape and rotation rate. They’re also far superior to what optical telescopes can resolve when it comes to asteroids, which, as their name implies, appear star-like or nearly so in even large professional telescopes. On Feb. 11, green-glowing comet 45P/Honda-Mrkos-Pajdusakova, made an unusually close pass of Earth, zipping just 7.7 million miles away. Astronomers made the most of the encounter by pressing the huge 1,000-foot-wide (305 meters) Arecibo radio dish into service to image the comet’s nucleus during and after closest approach. “The Arecibo Observatory planetary radar system can pierce through the comet’s coma and allows us to study the surface properties, size, shape, rotation, and geology of the comet nucleus”, said Dr. Patrick Taylor, USRA Scientist and Group Lead for Planetary Radar at Arecibo. Does the shape ring a bell? Remember Rubber Ducky? It doesn’t take a rocket scientist to see that the comet’s heart resembles the twin-lobed comet 67P/Churyumov-Gerasimenko orbited by ESA’s Rosetta spacecraft. Using the dish, astronomers have seen bright regions and structures on the comet; they also discovered that the nucleus is a little larger than expected with a diameter of 0.8 mile (1.3 km) and rotates about once every 7.6 hours. Go to bed at 10 and wake up at 6 and the comet will have made one complete turn. Radio observations of 45P/H-M-P will continue through Feb. 17. Right now, the comet is happily back in the evening sky and still visible with 10×50 or larger binoculars around 10-11 p.m. local time in the east. I spotted it low in Bootes last night about 15 minutes before moonrise under excellent, dark sky conditions. It looked like a faint, smoky ball nearly as big as the full moon or about 30 arc minutes across. This week, the pale green blob (the green’s from fluorescing carbon), vaults upward from Bootes, crosses Canes Venatici and zooms into Coma Berenices. For maps to help you track and find it night by night, please click here. I suggest larger binoculars 50mm and up or a 6-inch or larger telescope. Be sure to use low power — the comet’s so big, you need a wide field of view to get dark sky around it in order to see it more clearly. Very few comets pass near Earth compared to the number of asteroids that routinely do. That’s one reason 45P is only the seventh imaged using radar; rarely are we treated to such detailed views! To radar imager Lance Benner at JPL in Pasadena, asteroid 2017 BQ6 resembles the polygonal dice used in Dungeons and Dragons. But my eyes see something closer to a stepping stone or paver you’d use to build a walkway. However you picture it, this asteroid is more angular than most imaged by radar. It flew harmlessly by Earth on Feb. 7 at 1:36 a.m. EST (6:36 UT) at about 6.6 times the distance between Earth and the moon or some about 1.6 million miles. Based on 2017 BQ6’s brightness, astronomers estimate the hurtling boulder about 660 feet (200 meters) across. The recent flyby made for a perfect opportunity to bounce radio waves off the object, harvest their echoes and build an image of giant space boulder no one had ever seen close up before. 2017 BQ6 was discovered on Jan. 26 by the NASA-funded Lincoln Near Earth Asteroid Research (LINEAR) Project, operated by MIT Lincoln Laboratory on the Air Force Space Command’s Space Surveillance Telescope at White Sands Missile Range, New Mexico. Radar has been used to observe hundreds of asteroids. Even through very large telescopes, 2017 BQ6 would have appeared exactly like a star, but the radar technique reveals shape, size, rotation, roughness and even surface features. To create the images, Benner conducted a controlled experiment on the asteroid, transmitting a signal with well-known characteristics to the object and then, by comparing the echo to the transmission, deduced its properties. According to NASA’s Asteroid Radar Research site, measuring how the echo power spreads out over time along with changes in its frequency caused by the Doppler Effect (object approaching or receding from Earth), provide the data to construct two-dimensional images with resolutions finer than 33 feet (10 meters) if the echoes are strong enough. In late October 2016, the number of known near-Earth asteroids topped 15,000 with new discoveries averaging about 30 a week. A near-Earth asteroid is defined as a rocky body that approaches within approximately 1.3 times Earth’s average distance to the Sun. This distance then brings the asteroid within roughly 30 million miles (50 million km) of Earth’s orbit. To date, astronomers have already discovered more than 90% of the estimated number of the large near-Earth objects or those larger than 0.6 miles (1 km). It’s estimated that more than a million NEAs smaller than 330 feet (100 meters) lurk in the void. Time to get crackin’. On March 22, Comet P/2016 BA14 (Pan-STARRS) flew just 2.2 million miles (3.5 million kilometers) from Earth, making it the third closest comet ever recorded. The last time a comet appeared on our doorstep was in 1770, when Lexell’s Comet breezed by at about half that distance. Through a telescope, comet BA14 looked (and still looks) like a faint star, though time exposures reveal a short, weak tail. With an excellent map and large amateur telescope you might still find it making a bead across the Big Dipper and constellation Bootes tonight through the weekend. While normal telescopes show few details, NASA’s Goldstone Solar System Radar in California’s Mojave Desert pinged P/2016 BA14 with radar over three nights during closest approach and created a series of crisp, detailed images from the returning echoes. They show a bigger comet than expected — about 3,000 feet (one kilometer) across — and resolve features as small as 26 feet (8 meters) across. I honestly thought we’d see a more irregular shape assuming that astronomers were correct in thinking that BA14 broke off from its parent 252P/LINEAR though it’s possible it happened so long ago that the “damage” has been repaired by vaporizing ice softening its contours. Radar also shows that the comet is rotating on its axis once every 35 to 40 hours. While radar eyes focused on BA14, Vishnu Reddy, of the Planetary Science Institute, Tucson, Arizona, used the NASA Infrared Telescope Facility (IRTF) on Mauna Kea, Hawaii to examine the comet in infrared light. He discovered its dark surface reflects less than 3% of the sunlight that falls on it. The infrared data is expected to yield clues of the comet’s composition as well. Comets are exceptionally dark objects often compared to the appearance of a fresh asphalt road or parking lot. They appear bright in photos because seen against the blackness of space, they’re still reflective enough to stand out. Comet 67P/Churyumov-Gerasimenko, still the apple of the orbiter Rosetta’s eye, is similarly dark, reflecting about 4% of sunlight. What makes comets so dark even though they composed primarily of ice? Astronomers believe a comet grows a dark ‘skin’ both from accumulated dust and irradiation of its pristine ices by cosmic rays. Cosmic rays loosen oxygen atoms from water ice, freeing them to combine with simple carbon molecules present on comets to form larger, more complex and darker compounds resembling tars and crude oil. Dust settles on a comet’s surface after it’s set free from ice that vaporizes in sunlight. I live in Minnesota, where our annual State Fair features every kind of deep-fried food you can imagine: deep-fried Twinkies, deep-fried fruit, deep-fried bacon and even deep-fried Smores. Just now, I can’t shake the thought that comets are just another deep-fried confection made of pristine, 4.5-billion-year-old ice toasted by eons of sunlight and cosmic bombardment. Newly processed images of asteroid 2004 BL86 made during its brush with Earth Monday night reveal fresh details of its lumpy surface and orbiting moon. We’ve learned from both optical and radar data that Alpha, the main body, spins once every 2.6 hours. Beta (the moon) spins more slowly. The images were made by bouncing radio waves off the surface of the bodies using NASA’s 230-foot-wide (70-meter) Deep Space Network antenna at Goldstone, Calif. Radar “pinging” reveals information about the shape, velocity, rotation rate and surface features of close-approaching asteroids. But the resulting images can be confusing to interpret. Why? Because they’re not really photos as we know it. For one, the moon appears to be revolving perpendicular to the main body which would be very unusual. Most moons orbit their primary approximately in the plane of its equator like Earth’s moon and Jupiter’s four Galilean moons. That’s almost certainly the case with Beta. Radar imagery is assembled from echoes or radio signals returned from the asteroid after bouncing off its surface. Unlike an optical image, we see the asteroid by reflected pulses of radio energy beamed from the antenna. To interpret them, we’ll need to put on our radar glasses. Bright areas don’t necessarily appear bright to the eye because radar sees the world differently. Metallic asteroids appear much brighter than stony types; rougher surfaces also look brighter than smooth ones. In a sense these aren’t pictures at all but graphs of the radar pulse’s time delay, Doppler shift and intensity that have been converted into an image. In the images above, the left to right direction or x-axis in the photo plots the toward and away motion or Doppler shift of the asteroid. You’ll recall that light from an object approaching Earth gets bunched up into shorter wavelengths or blue-shifted compared to red-shifted light given off by an object moving away from Earth. A more rapidly rotating object will appear larger than one spinning slowly. The moon appears elongated probably because it’s rotating more slowly than the Alpha primary. Meanwhile, the up and down direction or y-axis in the images shows the time delay in the reflected radar pulse on its return trip to the transmitter. Movement up and down indicates a change in 2004 BL86’s distance from the transmitter, and movement left to right indicates rotation. Brightness variations depend on the strength of the returned signal with more radar-reflective areas appearing brighter. The moon appears quite bright because – assuming it’s rotating more slowly – the total signal strength is concentrated in one small area compared to being spread out by the faster-spinning main body. If that’s not enough to wrap your brain around, consider that any particular point in the image maps to multiple points on the real asteroid. That means no matter how oddly shaped 2004 BL86 is in real life, it appears round or oval in radar images. Only multiple observations over time can help us learn the true shape of the asteroid. 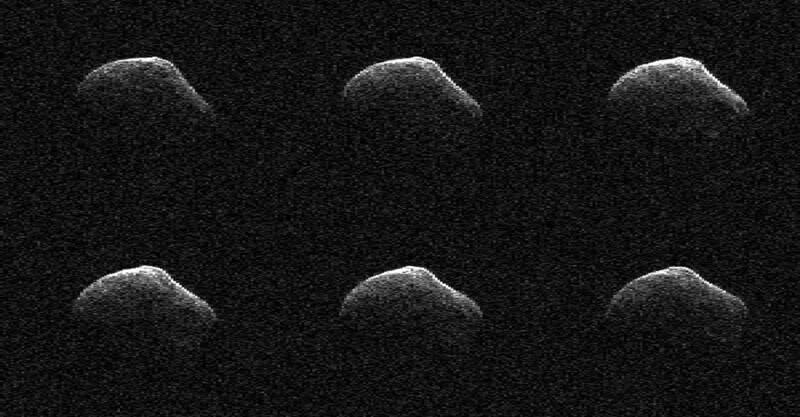 You’ll often notice that radar images of asteroids appear to be lighted from directly above or below. The brighter edge indicates the radar pulse is returning from the leading edge of the object, the region closest to the dish. The further down you go in the image, the farther away that part of the asteroid is from the radar and the darker it appears. Imagine for a moment an asteroid that’s either not rotating or rotating with one of its poles pointed exactly toward Earth. In radar images it would appear as a vertical line! Looking like the flowing designs carved by a Zen gardener’s rake, long parallel dunes of hydrocarbon sand stretch across the surface of Saturn’s moon Titan. The image above, acquired by Cassini in July 2013, reveals these intriguing and remarkably Earthlike landforms in unprecedented detail via radar, which can easily pierce through Titan’s thick clouds. I’m feeling a little more enlightened already. While our sand is composed of silicates, the ‘sand’ of these alien dunes is formed from grains of organic materials about the same size as particles of our beach sand. The small size and smoothness of these grains means that the flowing lines carved into the dunes show up as dark to the human eye. Radar imaging, although capable of seeing through Titan’s opaque orange atmosphere, doesn’t capture visible-light images. Instead it’s sensitive to the varying textures of a landscape as they reflect microwaves; the smoother an object or an area is the darker it appears to radar, while irregular, rugged terrain shows up radar-bright. The pixelated “seam” cutting horizontally across the center is the result of image artifacting. Learn more about Cassini’s RADAR instrument here, and read more about this image on the ESA site here. A Louisiana sinkhole the size of 19 American football fields shifted sideways in radar measurements before its collapse and resulting evacuations in 2012, a study reveals. The implication is that if certain types of radar measurements are collected regularly from above, it is possible to see some sinkholes before they collapse. The researchers added, however, that their discovery was “serendipitous” and there are no plans to immediately use a NASA robotic Gulfstream plane used for the study to fly over spots that could be vulnerable to sinkholes. 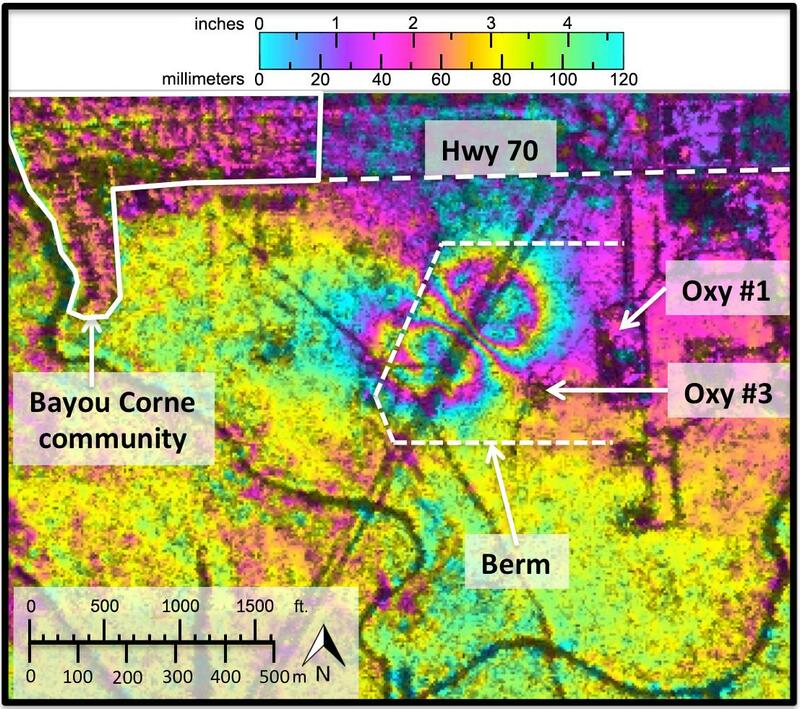 Data showed the ground near Bayou Corne moving horizontally up to 10.2 inches (26 centimeters) toward where the sinkhole appeared suddenly in August 2012. The hole started out at about 2 acres of size (1 hectare) — an area smaller than the initial ground movements — and now measures about 25 acres (10 hectares). The research was published in the journal Geology in February, and was first made available online in December. NASA highlighted the information in a press release published in early March. “While horizontal surface deformations had not previously been considered a signature of sinkholes, the new study shows they can precede sinkhole formation well in advance,” stated Cathleen Jones, leader of the research and a part of NASA’s Jet Propulsion Laboratory in California. Jones and her NASA JPL colleague, Blom, found the information in NASA’s interferometric synthetic aperture radar (inSAR), which flew over the region in June 2011 and July 2012 on the agency’s Uninhabitated Aerial Vehicle Synthetic Aperture Radar. The radar can see shifts in the Earth’s surface. The sinkhole — which is full of water and ground-up solids and is still getting bigger — collapsed after several small earthquakes and after the community became aware of “bubbling natural gas” in the area, NASA stated. “It was caused by the collapse of a sidewall of an underground storage cavity connected to a nearby well operated by Texas Brine Company and owned by Occidental Petroleum,” the agency added. Measurements of the area were taken as recently as October 2013, as the growing sinkhole is threatening the nearby community as well as a highway in the region. Tonight’s Harvest Moon Is For The Birds … Really! Tonight’s the Harvest Moon, the full Moon closest to the fall equinox. A perfect time to catch a big orange Moon on the horizon AND the annual fall bird migration. Every September and October anyone with a small telescope or spotting scope magnifying 30x can enjoy the sight of one bird after another flying over the cratered lunar landscape. It’s so easy. Point your telescope at the Moon and watch for dark silhouettes to flutter across its face. Because the angle of the full Moon’s path to the horizon is very shallow in September and October, the time difference between successive moonrises is only about 20-30 minutes instead of the usual 50-60. That means you’ll catch both moonlight and bird flight on successive nights without having to stay up late. Many birds migrate at night both because it’s cooler and to avoid predators that could otherwise pick them off in a daylight run. Identifying the many warblers, blackbirds, sparrows, vireos, orioles and other species that fly across the moon while we sleep may be next to impossible for anyone but an expert, but seeing them is easy. Two night ago for fun, I counted a dozen birds in the five-minute interval around 10 o’clock through my 10-inch telescope at low power (76x). Assuming they continued to fly by at a steady rate, I could potentially have spotted 144 birds in just an hour’s time. As you might suspect, most of those birds crossed the Moon from north to south (about two-thirds) with the other third traveling either east to west or northeast to southwest. Only one little silhouette flapped back up north in the ‘wrong’ direction. According to the Chipper Woods Bird Observatory, located in Indianapolis, most nighttime migrators begin their flight right after sunset and continue until about 2 a.m. Peak time is between 11 p.m. and 1 a.m. Bird typically migrate at altitudes ranging from 1,500 to 5,000 feet, but on some nights, altitudes may range from 6,000 and 9,000 feet. I could tell the high ones from the low ones by their size and sharpness. Nearby birds flew by out of focus, while distant ones were sharply defined and took longer to cross the moon. While birders may continue to use the moon night birding, they now have a new tool – NEXRAD or NEXt-generation of Weather RADar. About 150 NEXRAD sites were set up in the 1990s to track weather and storm systems across the U.S. When precipitation gets pinged by the radar’s pulse it reflects back a signal that identifies it as rain, snow or whatever. Included in the information is the material’s speed and direction of travel. NEXRAD works equally well on meteorite falls, birds and even insects. While storm activity typically shows up as familiar blotches of yellow, orange and red, birds appear as fine stipplings. By compiling NEXRAD loops, during particularly heavy migration times, you can actually watch swarms of birds wing their way south. Click HERE for a map of all U.S. NEXRAD locations, each of which links to current radar maps. On the less technological side, watching birds pass across the Moon in a small telescope is a very pleasant activity reminiscent of meteor shower watching. At first you see nothing, then blip! a bird (meteor) flies by. You wait another minute and then suddenly two more appear in tandem. Both activities give you that delicious sense of anticipation of what the next moment might hold. The best time to watch the nighttime avian exodus is around full Moon, when the big, round disk offers an ideal spotlight on the birds’ behavior, but anytime between waxing and waning gibbous phase will work. It’s an enchanting sight to see Earth’s creatures streak across an alien landscape, and another instance of how a distant celestial body “touches” Earth in unexpected ways.